Two identical bills, HB 2837 (link) and SB 727 (link), have been introduced in the Oregon Legislature this week. These bills direct the Department of Human Services to adopt a program to provide financial assistance to recipients of supplemental nutrition assistance (SNAP) for purchasing locally grown fruits and vegetables from participating farmers' markets, farm share sites and selected retail outlets in under-served areas. The programs will match the amounts a recipient spends on eligible foods using SNAP funds. The bill provides $3 million in funds and will take effect July 1, 2019, if passed. These bills, the result of efforts of The Farmers Market Fund (link), Oregon Food Bank (link), and Oregon Farmers Markets Association (link), builds on The Farmers Market Fund's successful statewide pilot program that ran from 2015-2018. Ninety percent of SNAP customers reported that they were able to purchase more fruits and vegetables because of the match program. Usage of Double Up Food Bucks (DUFB) grew 10% at the Hillsdale Farmers’ Market last year. But SNAP token purchases grew 20% in the same year. The $10 match has a very real multiplier effect and really helps neighbors with limited income purchase healthy food. What can you do right now? You can contact your state legislators. If you are not sure who is representing you, just enter your address here (link) and you can find out. You can also help spread the word in the community. Here is a one page flyer you can send to friends (link). We will be following this bill as it works its way through the legislature and will have updates in upcoming issues of The Grapevine. Last week we discussed some of the ways that the federal farm subsidy and crop insurance programs affect farmers and the food system. Specifically, we looked at how these policies impact the cost of food. If you didn't get a chance to read it yet, we'd suggest going back (and while you're at it, check out the Farm Bill update too). These aren't required for understanding where we're going today, but they'll sure help. You can find the back issues linked below. We should also note that, for the purposes of this series, we've decided to focus primarily on the costs and considerations associated with producing fresh produce - but that doesn't mean producers of meat, dairy, or other animal products aren't facing the same (and additional!) challenges when bringing food to market. One of the most important inputs in bringing our food from seed to table is people power, and it gets expensive. This holds especially true for specialty crops like fruits and vegetables. Across all types of farming, hired farm wages represented about 14% of total expenditures in 2016. For farms specializing in fruit and/or vegetable production, this cost was closer to 39% . Why is there such a big difference? Well, a lot of hands are involved in the process of planting, growing, harvesting, and selling produce. In general, fruits and vegetables are more delicate and require more careful handling than, say, any of the five commodity crops. Because of this, calorie-for-calorie more industrial crops can be produced per acre - with less effort. As one article on the mechanization of agriculture puts it, we're way better at producing corn than lettuce. Foods produced as part of the industrial agriculture system, like commodity crops, are often grown in what's known as a mono-culture or duo-culture, meaning that just one or two crops are grown on a vast acreage of land. Additionally, crops grown in this way are usually planted in evenly spaced rows. All this makes it easier for producers to rely on machines (instead of human labor) for many of the necessary steps in the production process. Contrast this with the labor involved on a smaller, diverse, mixed-crop farm, like those who attend farmers' markets. Last year, Gathering Together Farm published the Life of a GTF Tomato which outlines the lifecycle of the tomato crop. It is a great example of the hard work required to bring us produce each week. (Read the blog as soon as possible, it's truly eye-opening.) The short version? Every step of the process - from seed selection, to planting, to maintenance, to delivery, to sale - is done, meticulously, by hand. This takes a level of skilled labor unmatched by anything you'd see on an industrial farm operation. It also take A LOT of time. It's not impossible to increase efficiency by incorporating technology into growing produce, and even most small farms rely on machines to some extent, but the applications are fewer and further between. One reason for this is the delicate and methodical nature of produce production. But another reason is a lack of investment in technological research on the part of the federal government. Even though specialty crops make up a quarter of the value of farm products in the U.S., less than 15% of federal research and development funding has been directed to this sector over the past several decades. As a result, the efficiency of growing grains has increased much faster than for vegetables. More research could help vegetable farmers build better infrastructure and increase production of the foods we're told we should eat. Starting with the 2008 Farm Bill, the government has made strides to close the research investment gap - now $400M of the $3B annual agriculture research budget is dedicated for specialty crops2. This could pay off in reduced labor cost for farmers. Current USDA research projects include testing robots to harvest, select, and package apples; flavor improvements for commercial tomatoes; and changes to packaged lettuces and spinach. It's unlikely that any of our farmers will be using apple-picking robots to harvest, but technological advances do have a way of trickling down. And, the need for alternatives to people-power may soon reach its peak. About half of all U.S. farm labor is legally authorized to work here, and hired crop workers are even most likely to have been born outside of the U.S.. "Enforcement only" immigration policies, such as those being practiced by the current administration, put pressure on an already shrinking workforce. One 2014 study estimated that the lack of a skilled workforce could lead to up to 40% revenue loss for fruit and vegetable farmers. In the short term, this has already been brought to bear. Since 2016, farmers have experienced a net income loss of 9%. Many producers are unable to expand acreage, or even meet the yield of previous seasons, because they can't replace the skilled labor that has traditionally been done by undocumented immigrants. It is not uncommon for farmers to leave 15-20% of their product unharvested, and this number could go even higher if these trends continue. A smaller supply of produce could lead to higher prices for consumers. Even so, this pales in comparison to the human cost of such policies. In Oregon, 87,000 people are employed within the agricultural system - and much of the workforce is made up of families who have been living undocumented in our state since the 1990s or early 2000s. Last spring, Immigration and Customs Enforcement (ICE) began a series of raids in farming regions that led to the detainment and deportation of immigrants with children and spouses that are U.S. citizens5. This means that families have been separated and entire communities have been living in fear. By shopping at farmers' markets and supporting small, local agriculture we are somewhat removed from these challenges. But, we don't exist in a vacuum. Try as we might to build a better food system, the truth is that farmers' markets and small family farms remain a tiny portion of our larger food environment and are therefore affected by the larger forces and policies at work. We're affected by changes in technology that enable to further mechanization of industrial agriculture, widening the price gap between commercial and locally produced foods. Similarly, we're affected when immigration policies change the shape and size of the overall agricultural workforce. Finally, and perhaps most importantly, we're affected when those who the put food on our tables are being forced, en masse, to leave homes, families, and communities that they've built over decades. With the Agricultural Adjustment Act of 1933, Franklin Roosevelt signed into law what would become one of the largest and longest running safety net programs in America. The program began as a way to temporarily support struggling farmers and boost the economy during the Great Depression, but its central tenets - namely, paying farmers to not produce and guaranteed purchase by the government - were codified into law as part of the every 5 years Farm Bill in 1938. In the years since, parts of the food system have circumvented the normal rules of supply and demand because they have been deemed too important to fail. The vast majority of farm subsidy dollars are directed towards just five crops: corn, soybeans, wheat, cotton, and rice. When these so-called commodity crops are over-produced, the U.S. government steps in to purchase at a guaranteed price, and store the excess until it is needed. The program is designed to artificially limit supply and create a price floor so that farmers can continue production even in "lean" years. Essentially, the volatile swings inherent in an industry that is dependent on so many uncontrollable factors (i.e. weather, soil conditions, larger economic forces, etc.) are smoothed by the various programs in the subsidy system. Farmers are guaranteed an income, and consumers are guaranteed a product - stored product can be released and sold in times of shortage. But, the system that was designed to support family farmers hasn't worked as intended. Over the years, the major elements that make up the patchwork of the subsidy program have been adjusted and rearranged, but the problem remains that two-thirds of all subsidy payments are made to large-scale, wealthier-than-average producers of the five commodity crops. Small farmers, even those who do produce one or more of the commodity crops, are unlikely to reap the benefits. Fruits, vegetables, and meats are considered "specialty" products and do not qualify for the vast majority of subsidy programs. You would be hard-pressed to find a vendor at the Hillsdale Farmers' Market who is able to participate in federal subsidy programs outside of the crop insurance that they've bought into (and even that would be a stretch). The top 3% of farms receive 40% of all subsidy payments annually2. Unfortunately, the Federal Crop Insurance Program hasn't proven to be much more equitable. Through this program, producers can purchase insurance policies that protect them in the event of a revenue loss due to crop loss or a drop in price. Despite the fact that policies exist for over 100 crops, payments for producers of the commodity crops make up over two-thirds of all payouts3. Farmers pay just 40% of the premium (the other 60% is subsidized by taxpayers). In effect, the Federal Crop Insurance Program operates as a subsidy given that taxpayers foot the bill for over half of the premium, and are also responsible for a large portion of the payment to farmers in the event of revenue loss3. To be clear, we fully understand the importance of mitigating risk for farmers. We need producers to keep our country fed and our economy moving forward. There are so many uncontrollable factors in the farming industry that it makes perfect sense to provide a safety net for a sector that has such a large net impact on our society. A system in which 3% of farms receive 40% of payments doesn't make sense. Neither does a system in which five crops are kept (artificially) viable. Fruits and vegetables are widely regarded, even by the USDA, as the basis for a healthful diet. Yet these items are considered a specialty and their producers are given little, if any, financial support from the federal government. So what is the impact of these policies on the cost of our food? Truthfully, it's unclear. There is disagreement among economists, food scholars, and popular foodies over how much impact farm subsidies have on food prices. Many, Michael Pollan included, claim that these policies are directly responsible for the fact that unhealthier, processed foods are far cheaper than fresh fruits and vegetables. This argument does hold water, given that farm subsidies do encourage the production of commodity crops even when they're not truly "profitable". In contrast with the originally stated intent to control the supply and stabilize the market, decades of farm policy have led to a huge oversupply of the commodity crops. Thus, these foods are incredibly cheap and wind up in all kinds of products at the grocery store. But, others estimate that the impact is just a few cents on the dollar per calorie produced. Tamar Haspel doesn't dispute the mechanism, but begs the question of scale when discussing the impact of subsidies on the cost of food. In an analysis based on the total cost to produce various food items, she argues that the value of subsidies for corn, soy, and wheat hovered around 10% of the crops' total value in 20165. As with most things, the truth is likely somewhere in the middle. It is undeniable that commodity crops are much less costly to produce, and are therefore cheaper for consumers at the store. While subsidies surely have an impact, there are myriad other factors at play - the labor associated with production, yield per acre, cost of inputs during the growing cycle, transportation & refrigeration costs, and more. Keep that in mind because we'll explore some of these factors in next week's Grapevine. Even if there is disagreement over the magnitude of the impact, there is widespread agreement that the current system is broken. Critics from a variety of backgrounds - including farmers, environmental advocates, nutritionists, policymakers, and economists - agree that too much taxpayer money is spent lining the pockets of wealthy farm operators. This also means that too little is used to support the small and medium producers who bring us "specialty" crops. There have been limits for the past 30 years on the amount of money operations could receive from subsidy payments. There are many loopholes that savvy producers have used to exceed the $125,000 limit each year, but in theory these limits do exist. Whether or not they continue on after the 2018 Farm Bill is passed will be interesting to see. The version that passed the House would remove the cap and allow mega-farms to collect an unlimited amount of subsidy payments. It also seeks to eliminate funding for the education program that helps farmers to conduct risk assessments and reduce their own risk at the ground level7. At the same time, the Senate version provides hope: certain provisions seek to close existing loopholes and tighten eligibility requirements for subsidy and crop insurance payments. The U.S. is far from creating policies that reduce the cost of fruits and vegetables for farmers and consumers, proposed changes to the federal subsidy and crop insurance programs do not include increasing payments for specialty crops, but reducing payments for wealthy commodity producers is a start. Back in May, we shared a story about the Supplemental Nutrition Assistance Program (SNAP) and its relationship to the Farm Bill, a large-scale appropriations act that is responsible for the bulk of federal agricultural policy in America. At that time, no bill had been passed in either chamber of the Congress and it seemed unlikely that we would get a new package before the expiration of the 2014 Farm Bill (actually passed in 2015) on September 30, 2018. It is still unclear whether or not the 2018 Farm Bill will meet the deadline for passage, and a lot has changed since May. What follows is a brief (read: not comprehensive) update on the 2018 Farm Bill and a look to what we can expect to learn in the coming weeks. And these versions are very different from each other. The House passed the exact same bill that was proposed in April and defeated in May. Passed it narrowly, with zero Democratic support and losing 20 Republican members of the caucus. While our earlier piece focused primarily on the impact of the House Bill on SNAP, there were plenty of other "goodies" in there that farming advocates didn't want to see passed. These include the elimination of mandatory funding for a number of programs that support small farming operations; reduced support for programs like farm-to-school and produce prescriptions; expanded loopholes for subsidy and crop insurance programs that primarily benefit large commodity producers; and reduced incentives for farm-based conservation efforts. To be clear, these are just a few of the most egregious examples of turning the clock backwards. On the day of its passage, Portland Congressional Representative Earl Blumenauer summed up his feelings, tweeting: "Another shameful day in the House. GOP turns its back on family farmers & our most vulnerable & passes GOP Farm Bill.". A week later (June 28th) the Senate passed a version of the bill that is... not so bad. Actually, this version contrasted the House bill from the very beginning thanks to its standing as a popular, bipartisan piece of legislation that passed with 86 votes. Most notably, the Senate version does not include the work requirements and other restrictions to the SNAP program proposed by the House. It also maintains or increases investments in key conservation efforts; tightens eligibility restrictions for subsidy payments; and maintains funding levels for local food promotion programs. In short, the Senate version preserves the Farm Bill as a critical piece of the social safety net for both producers and consumers, while the House version does not. What comes next is an effort to reconcile the two bills in a Conference Committee before a single version will go to a vote in both chambers. By early August, both chambers had announced their membership for the Conference Committee - a group which will work towards a negotiated bill that can be voted on by the full Congress. They'll be working towards a consensus and compromise through a combination of public and closed-door meetings on the many key issues listed above. Additionally, the smaller discrepancies between the two bills will have to be negotiated as well. In the end, a majority of members from both the House and Senate committees must approve a single, consolidated farm bill to be introduced for a vote. The National Sustainable Agricultural Coalition (NSAC) provides a detailed breakdown of the major gaps that will need to be bridged before a final version can be voted on. In it, they also include handy, easy-to-read charts that contrast major provisions from the two bills plus their own policy recommendations. Unsurprisingly, NSAC is far more closely aligned with the version proposed by the Senate on every major provision. Largely thanks to the quick passage of the Senate bill, there is hope that the 2018 Farm Bill will pass before the current version expires. But, since we're waiting on compromise by both chambers and the signature by the president, it's not likely. There are some major differences across the two bills, and areas in which it would be dangerous (or at the very least be a slippery slope) for the Senate to compromise on. It is also difficult to know exactly where the bill stands, because there hasn't been a peep from the conference committee. Other members of the Congress, and the general public, are still able to comment in an effort to shape the final piece of legislation. In the coming weeks, we'll explore some of the issues related to the cost of food, including: subsidies, advertising, labor, and conservation. Each of these is deeply connected with and impacted by what happens with the Farm Bill, so you can expect that we'll refer back over and over again. As more news is made related to the 2018 Farm Bill, we'll share that too. In the meantime, if you're interested in learning more about the history and contents of the farm bill, check out this video by the Food & Environment Reporting Network (FERN). 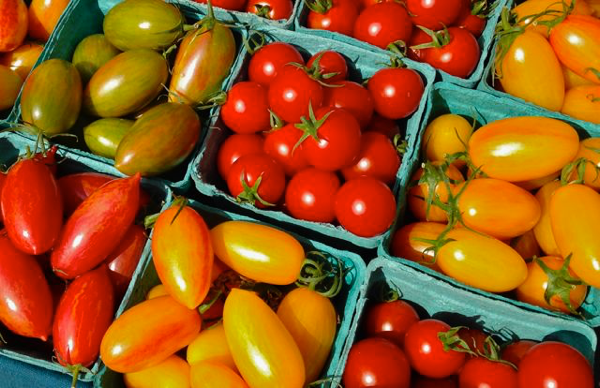 Each year at the height of tomato season, the market hosts one of our most popular events: Tomato Mania! Volunteers gather the day’s tomato selection from market vendors, slice them up, and spread them out with labels that state the variety name and the vendor that supplied it—comparison shopping at it’s finest! Take a moment out of your market day to explore the range of tomato flavor, savoring old favorites and discovering new ones. Below is a preview of some of the varieties we expect to be sampling this Sunday. Cherry Tomatoes: Sweet, bite-sized, and available in a rainbow of colors, the cherry tomato category also broadly includes pear tomatoes (shaped like their namesake fruit), grape tomatoes (larger than a typical cherry tomato), and currant tomatoes (smaller than a typical cherry tomato). Bright yellow-orange ‘Sungolds’ are one of the market’s most popular varieties—possibly the sweetest, most addictive cherry tomatoes you’ll ever taste! Cherry tomatoes are best eaten fresh: out of hand, topping salads, or folded into pasta just before serving. Purple Calabash: Green shouldered, pleated fruits with a distinctive flatness. Their flesh is nearly true purple and offers full flavor and well-balanced acidity some liken to a fruity cabernet. Delicious fresh or cooked. 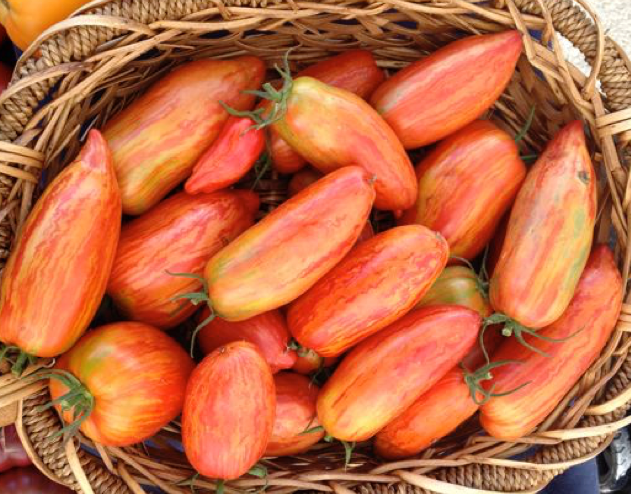 Striped Roman: One of the flashier tomatoes out there, this one has it all: sweet, rich flavor and fantastic color make ‘Striped Roman’ a marvelous fresh tomato for the salad plate. Like its cousin the red Roma, its meaty flesh cooks down easily into sauce—some say this variety makes the sweetest. 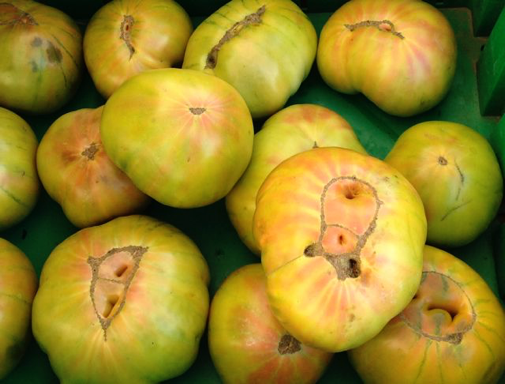 Aunt Ruby’s German Green: Green tomatoes are always a hard sell since our eyes are conditioned to seek out shades of red when it comes to tomato selection. This particular green tomato will wow you with the intensity of its flavor—rich, tart, and deeply sweet it can stand up to the best of the reds. 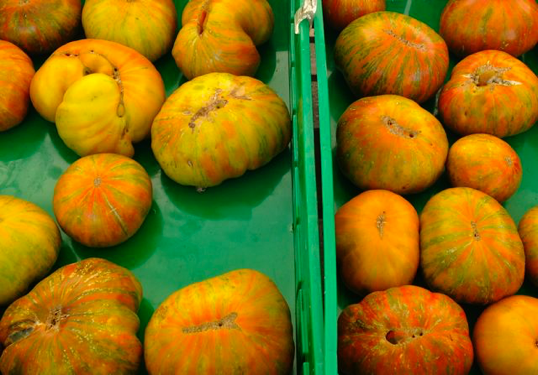 A favorite slicer among tomato connosuers, it also makes a delicious salsa verde. Listed on Slow Food’s Ark of Taste, a collection of heirloom seeds of exceptional quality, this is one beloved tomato. Look for those that are blushing a faint pink on the bottom—your cue that Aunt Ruby’s is ready for eating. 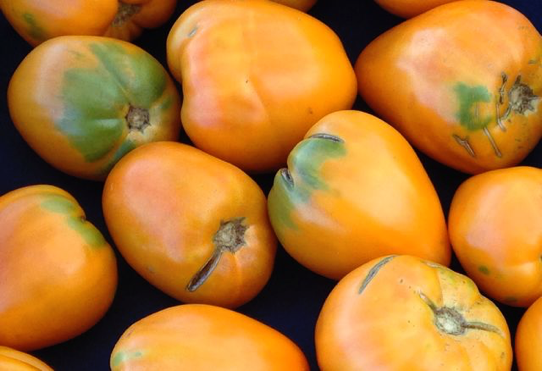 Chef’s Choice: An orange beefsteak-type, Chef’s Choice is a new hybrid tomato, an improvement on the popular heirloom, Amana Orange, which offers the same rich flavor with a quicker ripening period. A relatively new introduction, this variety was chosen as an All American Selection in 2013-2015 for its flavor and garden performance. 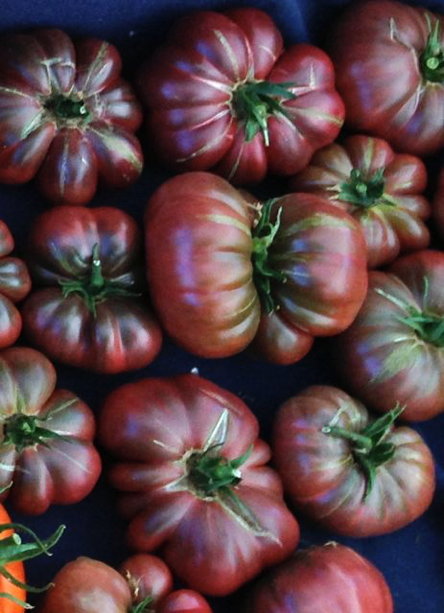 Cherokee Purple: This true heirloom (meaning it is not a recently developed cross of tomato characteristics but a strain whose seeds have been passed through generations of gardeners) plays up the savory side of tomato flavor: deep, rich, and earthy. Its purple skin fades to a saturated red in the tomato’s center. Curious about those green shoulders? Turns out they are a sign of superior flavor. The same genes that cause green shoulders in tomatoes are responsible for developing complexity and sweetness. The green parts may ripen much later than the rest of the tomato—don’t expect full ripening and peak flavor to coincide. Cut off the green and slice this heirloom favorite up for dinner! 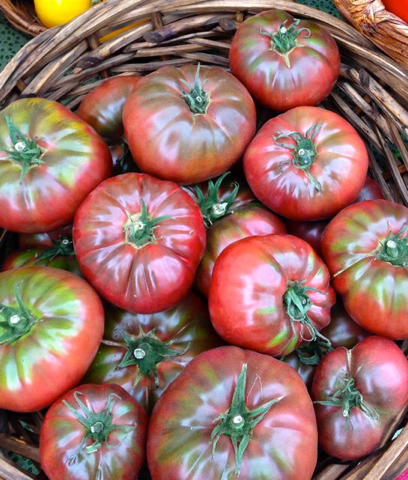 Black Brandywine: The original pink ‘Brandywine’ tomato was once the poster child of heirloom tomatoes; these days it has a lot more company, but it’s still delicious! ‘Black Brandywine’ is a selection from the original strain: similar rich flavor with skin blushed purplish-brown. Great for fresh eating or cooking. 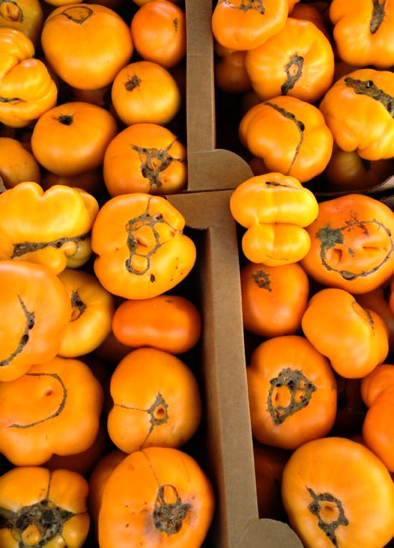 Yellow Brandywine: A yellow selection of the ‘Brandywine’ heirloom, revered for its surprisingly rich flavor and balance of sweetness and acidity. Best fresh, ‘Yellow Brandywine’ adds a lighter touch to sauces or salsas. 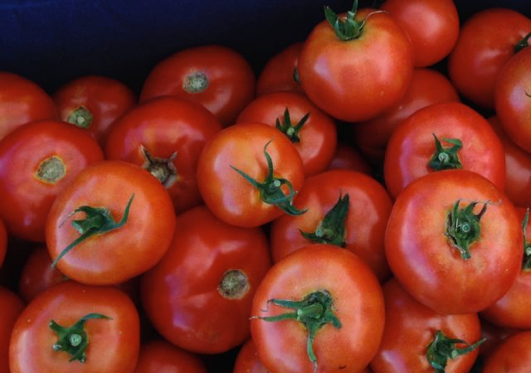 Rutgers: A New Jersey heirloom introduced in the 1930’s truck farming boom, Rutgers was bred as an improved field tomato: with more uniform ripening, richly flavored juice, small seed cavities, and good yields. Though it fell away from commercial popularity when firmness for shipping became the priority, Rutgers remains popular among home gardeners, who use it for fresh eating and preserving. Orange Oxheart: Oxheart tomatoes have a reputation for offering the best of both worlds: firm, meaty flesh ideal for making salsa or sauce, along with the fragrant, acidic juiciness so coveted in a slicing tomato. 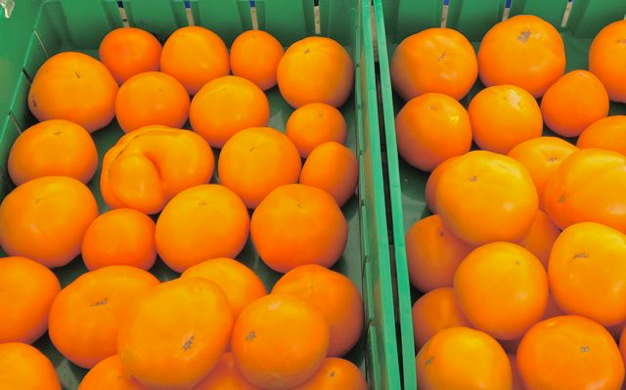 This orange variety is the perfect slicer for sandwiches, fresh sauces, or pizza topping. Pineapple: This carnival-striped tomato is what summer is all about—full-bodied tomato flavor, rich colors, and enough acidity to keep things interesting. Slice this giant to serve with anything that comes off the grill, or just eat wedges of it with nothing more than a sprinkle of salt and the juice dripping down your fingers. 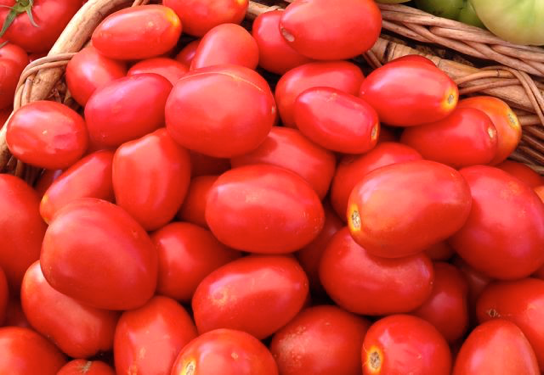 Roma: A type of plum tomato, ‘Roma’ and similar varieties are the quintessential sauce tomato. Their drier flesh and smaller seed cavities concentrate into perfect sauce and are ideal for halving and slow roasting in a low-temperature oven. Synonymous with Italy, these are the home-preserver’s tomato of choice for canning whole and as sauces, ketchup, or pastes. Note: This article was originally published in 2014 and republished in 2015. Tomatoes as an ingredient hardly need an introduction. Once you’ve located a quality specimen, they are one of those foods that you want to alter as little as possible. Perhaps the only best way to eat a ripe tomato is still warm from the vine, their leaves’ zesty perfume wafting from your fingers to mingle with the fruit’s sweet sorcery. But, lucky for us, tomatoes are more versatile than that; perfection comes in many forms. The following recipes prove that a little manipulation can go a long way to heighten, enhance, and honor the essence of a perfect tomato. Perhaps the best way to describe what to do with a good tomato is to emphasize what not to do with it: that is, keep your tomatoes out of the refrigerator. 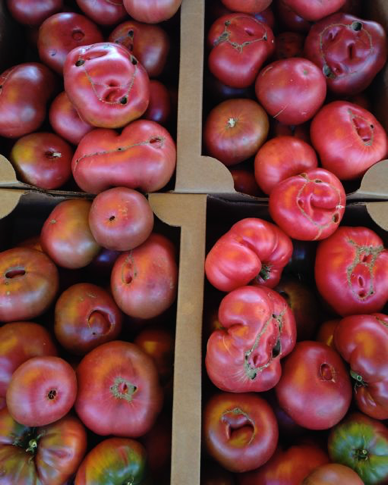 Cold temperatures obliterate the delicate texture, fragrance, and flavors of homegrown and farmers market tomatoes. Resist every temptation to put them anywhere but a shady corner of your kitchen counter, and your next tomato masterpiece is already ninety-nine percent complete. Drowned Bruschetta – The key to a good bruschetta is getting the bread (aka crostini) as crisp as possible. I slice a baguette diagonally to get long, ¼-inch thick slices that I brush on both sides with olive oil. I toast them on a tray in an oven set at 250-degrees, turning them after about five minutes, until both sides are lightly golden and crisp. While the crostini cook and then cool, I slice my tomatoes into ¼-inch bits and heap them in a bowl (I like to mix colors and varieties, but whatever tomato you like best will do), drizzle them lightly with olive oil and a good balsamic vinegar, salt liberally and grind some fresh pepper on top. I turn in the seasonings with freshly torn basil and let the mixture rest a few minutes while I arrange the crostini on a plate. On top of each, I add a heaping spoonful of tomato topping (not worrying if it slides off or mingles with the topping next door—at my house, at least, bruschetta is a beautiful mess), then drizzle them with the liqueur from the bottom of the bowl, soaking the crostini and, if I’m lucky, even leaving a small pool at the bottom of the plate. A well-crisped crostini won’t get soggy; its buttery crunch gives body to the succulent tomatoes and their luxurious juice. Tomato & Mint: Mint plays up the sweet side of tomato flavor, while the tomato’s earthier tones ground mint’s flighty disposition. Tabouli, with a parsley and bulgur backbone, makes skillful use of this spirited arrangement. But the two are also delicious just on their own, as in this simple and refreshing summer salad: (link to recipe).